THE MINACK'S dramatic setting, open to the elements, with a jaw-dropping backdrop of sea and sky, provided the ideal launch pad for a night of epic and ethereal sounds from Penwith-based band The Ascension Plan and special guests. 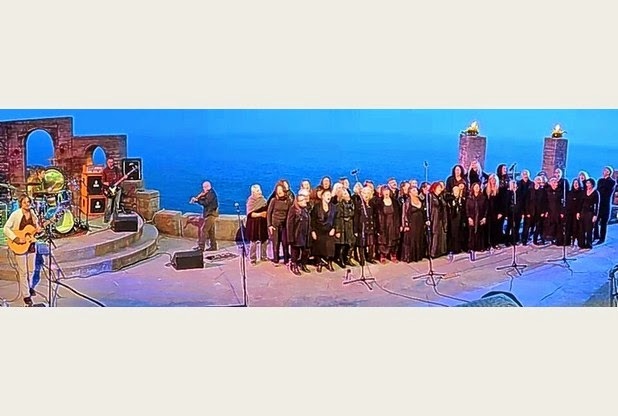 On Friday, May 2, hundreds gathered on the cliffs at Porthcurno to witness the four-piece band join forces with New York singer Mimi Goese, of 1980s cult American band Hugo Largo, and Penzance choir the 50 Degrees. The night marked what the band call, "the completion of a curious circle". The circle began back in the 1990s with Quietly Torn, the band started by The Cure's Porl Thompson when he moved to Zennor. When Mimi Goese, the band's original singer, left – homeward bound for New York – Thompson recruited St Just guitarist and singer Martin Jackson, then 16 years old. On a May evening in 1998 Martin took to the Minack stage to play a memorable gig with Quietly Torn. Martin went on to form The Ascension Plan with Quietly Torn drummer Nick McLeod, bassist Mungo Shoddy and former Bates Motel man Paul Adams on electric violin. In 2012, on opposite sides of the Atlantic, Nick McLeod (who also plays with The Incredible String Band's Clive Palmer) and Mimi Goese began to hatch a plan. This resulted in Mimi's collaboration with the band on a number of tracks, including Ascending, from their All Ways EP, and forthcoming singles Buoy and Life (You Are). 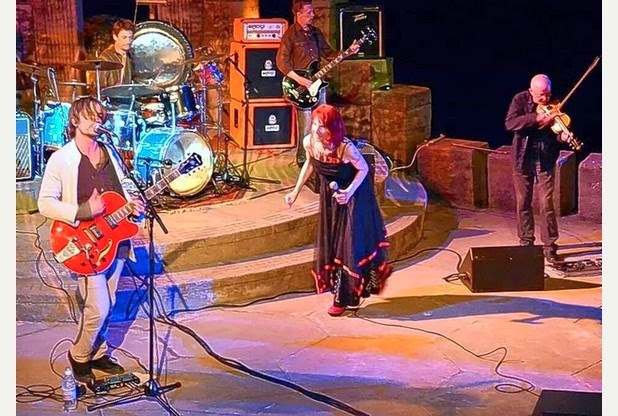 Ultimately, it led back to the Minack and the wild Cornish cliffs on a May evening in 2014, bringing Mimi and Martin together to share the stage for the first time. The result was an evening that managed to pull off the feat of being both intimate and epic. Axolotl set the tone with an introductory soundscape that melded with the waves and the wind. Building from womb-like gongs and elemental murmuring, The Ascension Plan's sound swelled into celestial flights of liquid violin melting into out of this world vocals, transporting the listener to realms at once familiar, strange and beguiling. With years of collective musical experience under their belts, the band moved together effortlessly through the haunting waltzing chorus of Old Wings, via the alternating swing and raw power of Disengage (and Remain The Same), the ethereal Ascending and meditative All Ways. Mimi Goese brought her extraordinary and formidable vocals into the equation – which can also be heard on Moby's Into The Blue and When It's Cold I'd Like To Die – bringing theatrical flair and sparkle to the stage along with her trademark vocal acrobatics. Adding the vocal harmonies of the 50 Degrees choir into the mix, under the skilled direction of Vicky Abbott, sent beautiful, fluid, yet precisely aligned harmonies rushing across the Cornish skies. "The sky and sea stitched seamlessly," Mimi sings on the forthcoming single Life, (You Are). As the daylight faded, sea and sky vanished into one another and the stage was bathed in a dance of colours, courtesy of projections by renowned local artist Paul Lewin. Sky, sea, music and light stitched seamlessly into a mesmerising fabric, entrancing the senses. The resulting frisson carried echoes of Sigur Ros at the Eden Sessions. Maybe it's the tuning, the band tune their instruments to a pitch of 432HZ – said to be the natural universal frequency – rather than the standard concert pitch of 440HZ. Maybe it's the combined power of more than 50 voices. Or maybe it's just that special something that ignites when a plan comes together beautifully. Whatever the secret, this will be remembered as a night when magic was made, when The Ascension Plan unfolded their wings and took flight with Mimi Goese and the 50 Degrees.